The computer that gives the episode its name, symbolically or literally depending on your stance, has taken over the creative hub of SC&P. Erin Levy’s script emphasizes the meaning of this, for the company and those who inhabit it. Multiple characters vocalize the obviousness of losing working space for paradigm-shifting technology. The reason the symbol here is so clear is because everyone around it knows what’s going on. At this point, in 1969, the victory of one generation over the other is clear. Don may drink away the pain, but he no longer seems as deluded as he once was. Roger loses his connection to the youth of the world, realizing that whatever values he thinks he has don’t connect to the world of hippie communes. The tides have been shifting for years, but they’re not anymore. The progress, and the damage that comes along with it, are officially the establishment. That doesn’t mean the revolutionaries have won. That’s rarely how revolutions end. Instead, the cracks in the walls of the past have allowed pieces of something else to trickle through. Maybe the new generation doesn’t care about advertising, but this hasn’t ruined the industry. If anything, it’s made them more cynical, clawing at a lowest common denominator instead of the sensual artistry of Don Draper’s best work. Those on the commune live with a disregard for society, but casualties are ignored, like abandoned children and unhealthy habits. This life will never become the standard, but in ways it’s of a piece with what came before. The particulars may be different, but as Margaret, er, uh, Marigold, makes clear she’s just following the tradition of her father. They’re both absentee parents in denial of the hurt they’ve caused. The technology may change, but do the people using it? As Lloyd, the computer salesmen, says, “these machines can be a metaphor for whatever’s on people’s minds.” To some, they’re the monolith, granting an evolutionary path for mankind. For others, they’re a stumbling block, taking away the human element of hard work. What the arguing groups seem to ignore is that technology is just a different way to do the same thing. The New Age folk reject electricity to remain pure, but people are people in any context. The most important thing that technology does in “The Monolith” is create anxiety. When Don confronts Lloyd (“I know who you are”), he’s reacting to the possibility of a world he doesn’t know, not the world itself. The fear of the future is much more potent than the future itself. There is so much worrying about what the years will bring, clashing against the glimmers of hope throughout. The moon is brought up numerous times, as a potential destination just out of reach. Don finds and hangs up Lane’s New York Mets pennant, a symbol of both death and the upcoming winner of the World Series. There is always enough hope to keep going, and there is always enough strife to temper that hope. We will land on the moon and the Mets will win the championship but young men are dying in Vietnam and Nixon is president. Lloyd is right; these things can mean whatever a person takes them to mean. That pennant is an artifact of a tragic event, and the harbinger of a great victory. Nothing means one thing. So if “The Monolith” seems overt in its symbolism, that’s only for a larger purpose: everything seems obvious to the person it seems obvious to. Don sees the couch as a coffin, his warped view making the ceiling look distorted. To Ginsberg, a couch is the last bastion of truth in a world overrun by fools. Lou giving Peggy control over the Burger Chef account is both power and punishment. A bum lighter is the error of technology to Don, and the fault of man to Lloyd. The point being, the symbols on Mad Men are only glaring if you view them through the lens of any particular character. In a vacuum, the computer making its way into the offices at the episode’s end is just a computer. Because we are so heavily entrenched in Don’s viewpoint, we see them as the enemy. But it’s all a matter of perspective, and the dueling interpretations of the symbols throughout this hour prove that this is the point. 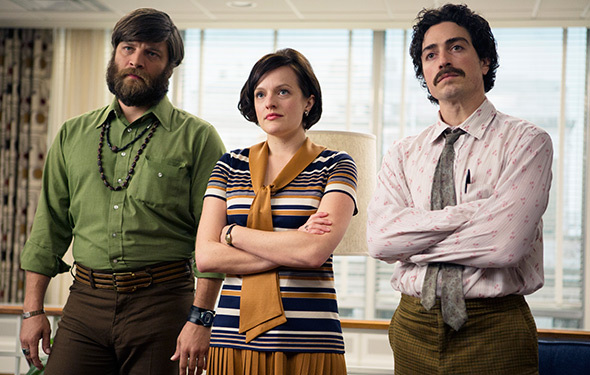 Freddy Rumsen stands as almost solitary proof that those in the world of Mad Men can change. This may be a cynical universe, but it is not a callous one. Freddy’s speech to Don, a highlight of the season thus far, illuminates that while fate may have plans, human effort can make a difference. The previously on segment has a clip of Bonnie, likely to remind the viewer that she’s around, but also to bring up a line of hers that is proven here “Our fortunes are in other people’s hands. And we have to take them.” Don, doing grunt work for Peggy’s account as the screen cuts to black, seems to be grasping for power in his own life. As his descent into a drunken afternoon reminds us, self-sustaining patterns are not easily broken. Simplicity and possibility are not one in the same, though. Don has taken steps since the season six finale, and this may just be another step, one that may be retreated from eventually. But one small step can be significant. In what seems ironic, at least from the perspective from seasons ago, Freddy now stands as an agent of change. The penalties of his past still weigh on him, as freelancing seems to be his only possibility. This is why he nearly begrudges Don for not taking full advantage of the ground he still has. In Freddy’s eyes, Don is as lucky as an alcoholic can get. He’s screwed up numerous times but he’s getting a second chance. It may be a pale opportunity, but it’s better than nothing, which is where Don is heading. It’s no mistake that Freddy mentions suicide in an episode so heavily covered by the shadow of Lane Pryce. It takes work to break any type of cycle, be it depressive or alcoholic. Don seems to hold onto to the notion that he’s owed something, and this succession of rock bottoms has seemingly taught him otherwise. He acts as a petulant child for much of “The Monolith”, angry at the lot he’s been given. Hopefully his final actions here signify that he realizes he has dug himself into this bottomless pit. Hopefully realizing that will allow him to pull himself out. The way that Roger’s plot resolved felt too surface-level, hence the lower grade. It was a bit too reliant on “daddy issue” archetypes.